If, for example, you require two 8ft x 3ft banners with different artwork, you add just one banner to your ‘Shopping Cart’ and then click ‘Continue Shopping’. 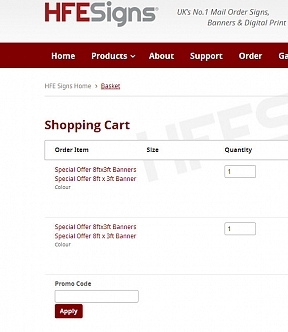 Go back to the product page (banners for this example) and add one banner again, your ‘Shopping Cart’ will now contain two individual 8ft x 3ft banners, this allows for two artwork requirements. This can be repeated for the mixed quantity you require. If, for example, you require two banners with the same designs you add the product once and choose quantity 2, this allows for duplicated artworks.